Daniel Howard with his wooden furniture. A businessman who converted a Galashiels garage into a joinery workshop without permission has won his battle with council planners. Daniel Howard, a director of Kilnknowe Caravan Park in Wood Street, Galashiels, bought the disused Reburn Garage, on the A72 Galashiels-to-Peebles road, and began operating a furniture repair and sale workshop from the site. Daniel Howard with a wooden carving. The garage, once known as Bruce Motors, has been closed for several years, and Mr Howard says the land will create up to 25 jobs for the area. After letting out to several businesses from the site, including a joinery workshop, a garden statue store and a car wash, Mr Howard then applied for retrospective planning permission from Scottish Borders Council’s planning department. However, planners scuppered his proposals, saying that the joinery workshop in particular is having a detrimental effect on the character and visual amenity of the area, and that Mr Howard has not demonstrated that there are no alternative sites available closer to the town centre. Outlining the reasons for refusal, the council’s planning officer Carlos Clarke wrote: “Aspects of the development are acceptable, subject to conditions, particularly to rationalise the number and appearance of the various small structures proposed. “However, the joiner’s workshop and retail sales would be contrary to the local development plan, and this conflict is not overridden by other considerations. “As these elements form a significant part of the development proposal, it would not be appropriate to delete them from a prospective consent by condition. 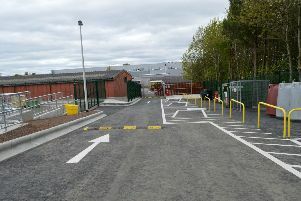 Mr Howard subsequently appealed to the council’s local review body, which met on Monday to deliberate on the application. In his appeal statement to the review body, Mr Howard wrote: “I believe I have transformed a failing site with no future use prospects into individual units creating jobs and increasing revenue in rates and taxes. “I have requested a site visit so that the local review body can see that this joinery workshop is no more detrimental to the character and amenity of the area than a garage workshop. “Added to this point is that as a joinery workshop, it is less of a noise or spillage pollutant than the former garage was. “It is hard to see how it can be conceived as so different to a garage? Anyone looking in would see a joiner or a mechanic – is that enough of a difference to refuse the application? Speaking at the local review body meeting, Galashiels and District councillor Sandy Aitchison urged his fellow councillor to overturn the officer’s decision. He said: “I have to say it’s quite complex. It used to be a car garage and in respect of what we’re looking at now it isn’t that different. “It’s on the absolute boundary of Galashiels, but it’s always been used for business. “In my opinion the little parts of this business are important in making the whole sustainable. “I think what we’ve got here is the potential for a good business with all the little parts making up the whole and I would be really depressed if the business itself became non-viable due to the refusal of the joinery workshop and showroom. Fellow Galashiels councillor Andy Anderson concurred, saying: “It seems to me that it was previously used for industry and car repair, and a joinery workshop, although it uses a different material, is still industrial usage. “I don’t necessarily feel that this would be competing with our town centre businesses. Councillors voted to overturn the officer’s decision and grant retrospective planning permission for Mr Howard, although officers will enforce several conditions on the development. The conditions include imposing rules on water disposal; noise and odour pollution; industrial contamination; and road usage.